Riso Bello - Vialone Nano Risotto Rice, Gluten Free - 17.5 oz (Pack of 12) by Riso Bello at Smokey Robinson Foods. Hurry! Limited time offer. Offer valid only while supplies last. 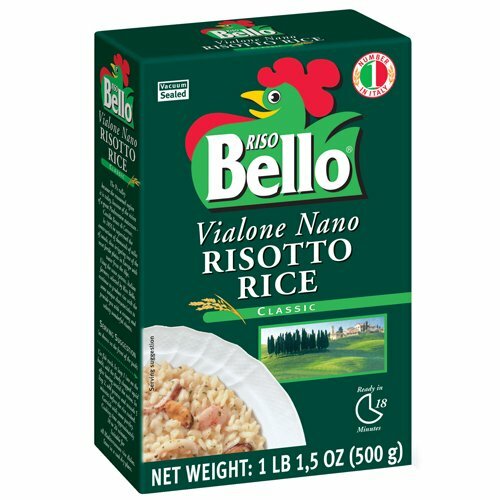 Produced by the leading Italian Rice producer, Riso Gallo(founded 1856), our Riso Bello brand of Vialone Nano rice is a premium quality risotto rice. Produced by the leading Italian Rice producer, Riso Gallo(founded 1856), our Riso Bello brand of Vialone Nano rice is a premium quality risotto rice. Vialone Nano rice is a short and fat grain which is perfect for cooking a more creamy style of risotto in particular those incorporating seafood. To get the perfect velvety consistency you must start with the best rice milled to the very highest standards. Vacuum packed to maintain freshness. Gluten Free. No additives. GMO Free. View More In Rice Dishes. If you have any questions about this product by Riso Bello, contact us by completing and submitting the form below. If you are looking for a specif part number, please include it with your message.